Consists mostly of notes, photographs, and letters pertaining to political and store tokens, store cards, 1939 Matron Head large cents, Feuchtwanger Cents, and other topics. Alfred Zantzinger Reed (1875-1949) of Colorado Springs, Colorado, published articles on U.S. medals, tokens, and store cards, and books on legal education. Alfred Zantzinger Reed papers, 1943-1945, Archives, American Numismatic Society. Alfred Zantzinger Reed (1875-1949) of Colorado Springs, Colorado, published articles on U.S. medals, tokens, and store cards, and books on legal education. He studied at Harvard (1894-1898) and Columbia (1906-1911), and was an instructor in the Philadelphia School of Pedagogy (1898-1902) before moving to New York City to study. He eventually settled in Colorado Springs. He became an associate member of the American Numismatic Society (ANS) in 1933. In 1949 his estate bequeathed 1,998 pieces to the ANS, including presidential and political medals and tokens, Hard Times tokens, and store cards. He is buried at Evergreen Cemetery in Colorado Springs. 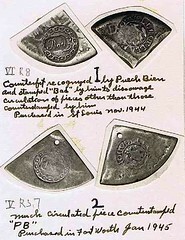 Consists mostly of notes, presumably for articles, on topics such as New Orleans store tokens, Feuchtwanger Cents, store cards, the 1939/36 Matron Head large cent, and the die cutter	B.C. True. Includes photographs of U.S. tokens and coins. Also present are letters (1943) from J. Doyle DeWitt of Connecticut to Reed regarding political medals and tokens, and a letter (1945) pertaining to the Matron Head cent.